Tonight, the Republican presidential candidates will try to Reagan harder than they've ever Reaganed before. Why? Well, because former President Ronald Reagan is thought by many to be the founder of modern Republicanism. During his tenure, as CNN put it, their movement "slayed communism" and restored America to the shining beacon of hope that it once was. Sure, this might sound grandiose, but we're talking about America here! And we're talking about Reagan! I mean, the debate is going to be held in the Reagan Library in California. How much more Reagan can you get? The GOP presidential candidates will no doubt invoke Reagan's name a number of times throughout the night. But just which candidate will show Reagan the most love? Bustle has a graphic to answer that important, American question. Many conservatives believe that the two Bush presidencies after Reagan — and all of the GOP nominees in between then and Barack Obama's presidency — failed because they strayed too far from Reagan's ideals. Now, many of them are trying to return to those ideals, or at least what they believe those ideals to be. Who claims to have the most love for Reagan? When it comes down to it, Wisconsin Gov. 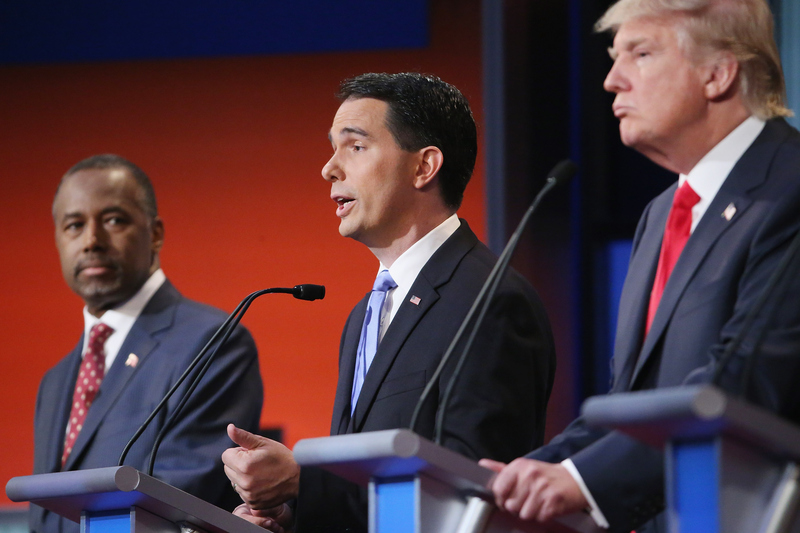 Scott Walker is sure to be one of the most Reagan-loving candidates at tonight's debate. Walker has previously compared himself to Reagan because he just loves him so much. And he wears socks with Reagan's face on them. OK, that last part isn't true, but I bet that he would if he could. He loves Reagan so much that he has previously claimed to have voted for Reagan when he was a teenager, and then later admitted that he was actually too young to have done so. New Jersey Gov. Chris Christie is second on the list of Reagan's biggest fans. In a speech at the University of New Hampshire in June, Christie said that 2015 is like 1979, and that he is the Reagan who will save us all. Walker and Christie will call upon Reagan's name 'til death (of communism and income taxes), while Donald Trump and Texas Sen. Ted Cruz fight to keep up.